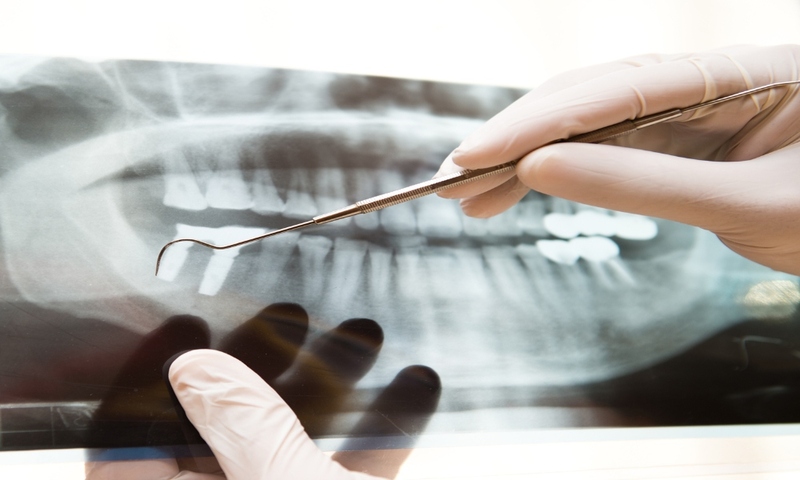 Dental X-rays- When Do You Need Them? Dental x-rays are a form of electro magnetic radiation that help Dr Jamie complete the picture of your mouth… showing him areas he cannot otherwise see. Most commonly this is in-between your back teeth, around the roots of a tooth and checking the bone that supports them. X-rays help catch problems early on, before they get chance to develop into something that’s painful and more damaging: requiring more extensive, more expensive and more time-consuming treatment. Together with the clinical examination and associated questions, Dr Jamie will get a much more accurate and complete picture of what is going on in your mouth. What are the reasons for taking x-rays? • Screening- as part of the check up and clean, they will be taken at certain intervals, relative to your caries risk profile. You can pick up problems with existing fillings, crowns, implants and look for early signs of tooth decay or gum disease. • Diagnosis- if you have presented with a problem, x-rays will provide valuable information about the problem and possible treatment. • Treatment- x-rays are needed as part of the treatment plan for fillings, crowns, root canals, wisdom teeth, implants, gum disease and much more. However, In general terms we don’t need to take x-rays of the front teeth for screening, as the teeth are so thin. When the light reflects in our mirror, we can visually see decay between the teeth- a process known as trans-illumination. What about screening x-rays? How often do I need them? If you are a new patient, Dr Jamie may recommend that you have x-rays at your initial visit in order to provide a more comprehensive first examination, and to act as a baseline for any changes that can occur over time. But, if you’ve had X-rays in the last year at another practice, it would be fine to bring them with you, or email them to info@drjamieworkman.com.au. Assuming everything was fine, we would delay taking them till the next time or even the time after that! Radiation of any sort is ‘not’ 100% safe, but what most people don’t realise is that we are exposed to radiation all day… everyday from the sun and other sources… even in our foods. Large doses come, for example, when we take a flight! Medical x-rays have a very low dose of radiation, but should of course be used appropriately and minimised as much as ‘reasonably’ possible. They are vital to both successful treatment and diagnosis and dentistry cannot function safely without them. You can read more extensively about dental x-rays on Dr Jamie’s education site jamiethedentist. What about x-rays during in pregnancy? X-rays should be avoided during pregnancy, unless absolutely necessary. The foetus is particularly sensitive in the first trimester (2-9 weeks) when the vital organs are developing so avoid any x-rays here. Routine X-rays should be delayed until after the birth, although untreated infection can pose a significant health risk to mother and baby so in certain circumstances later in the pregnancy, they may be necessary. What different types of x-rays are there? Intra-oral x-rays and Extra-oral x-rays. You are likely to have had both on some occasion during your dental lifetime and some, like those for screening much more frequently. • Bitewings (screening x-rays) – show you in-between all the back teeth on the top and bottom and are called bitewings because you bite down on a little tab or holder- great for assessing for decay and gum disease. • Peraipicals- show the whole tooth, roots and supporting teeth in one area (about 3-4 teeth): these are needed for implants, crowns and bridges to assess the roots, and for the diagnosis and treatment of tooth pain and root canals. 1. OPG- shows all the teeth, bone, jaws and joints on both sides. Great for children and developing teeth especially as part of orthodontic treatment, for checking wisdom teeth and for a general overview of the mouth including levels of gum disease or bone loss. 2. Cone Bean CT- here we move from 2D to 3D technology to assess areas for implants, wisdom teeth and more difficult cases of diagnosis or root canal treatment. You can enhance the contrast and change the lighting, texture and brightness to aid diagnosis.